“Where?” “Of what?” “Why?” These are questions often asked of someone who is planning on getting a tattoo. 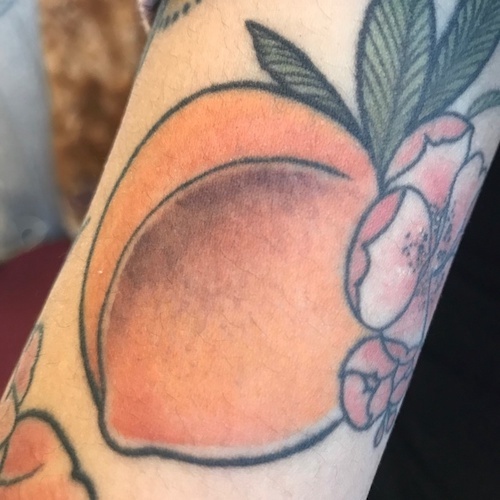 Another common question: “Is it safe?” You can vet the cleanliness of a tattoo parlor and the artist’s qualifications, but there hasn’t been much research into what happens to ink once it enters the body. 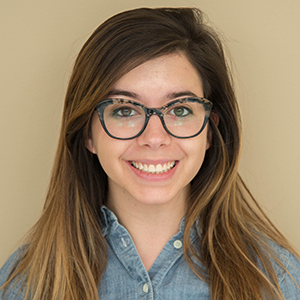 A research group recently investigated if tattoo pigment can harm skin and the lymphatic system using techniques such as mass spectrometry and X-ray fluorescence. There is substantial research into the chemical makeup of tattoo ink and what happens when it degrades, but most of these experiments happen in vitro. 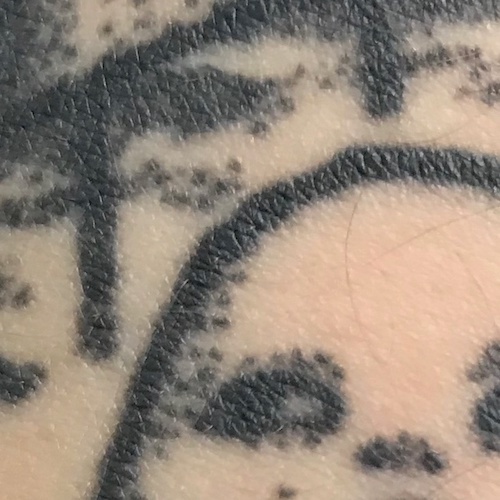 For an accurate picture of how tattoo pigments interact with the body, in vivo experimentation is necessary, but — for obvious ethical and logistical reasons — rare. Recent statistics show that nearly four in ten young adults have at least one tattoo. Perhaps this knowledge gap in tattoo safety would have been acceptable a few decades ago. However, a study by the Pew Research Center shows that as of 2010, 38% of people aged 18–29 had at least one “tat”. Per the Harris Research Poll, this number had grown to 47% in 2015. This growing number sparks more prevalent health and safety concerns. The body actively tries to rid itself of foreign objects and substances, whether introduced for our health (e.g., a medical implant) or cosmetic reasons (e.g., tattoo ink or a piercing). When ink is injected into the epidermal and dermal layers of the skin, the intended design heals and becomes a permanent tattoo. However, the body transports some of the tattoo ink particles via translocation. This can either be passive, via blood and lymph fluids that carry the particles, or active, where immune cells phagocytize and deposit particles in the lymph nodes. 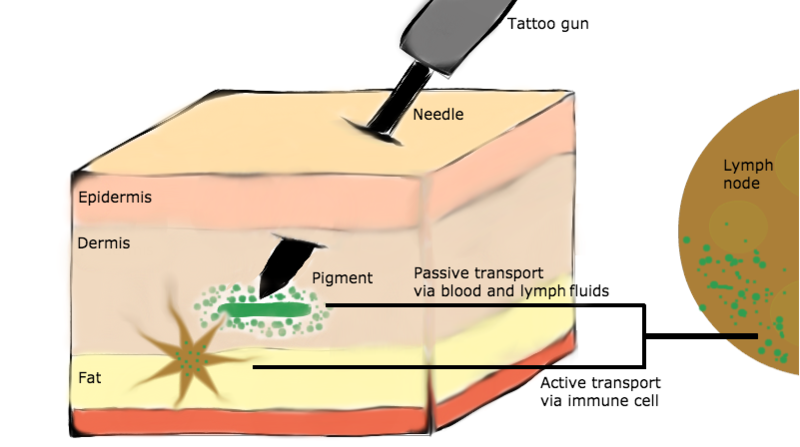 Active and passive transportation of tattoo pigment particles from the epidermis to a lymph node. Illustration inspired by a paper by I. Schreiver et al. (Ref. 1) as well as the author’s own general knowledge of the tattoo process and skin layers. The main objectives of the study were to provide evidence of translocation of tattoo pigment from skin to lymph nodes and the presence of elemental substances from tattoo ink in skin tissue. The study does not suggest whether or not the effects are harmful. 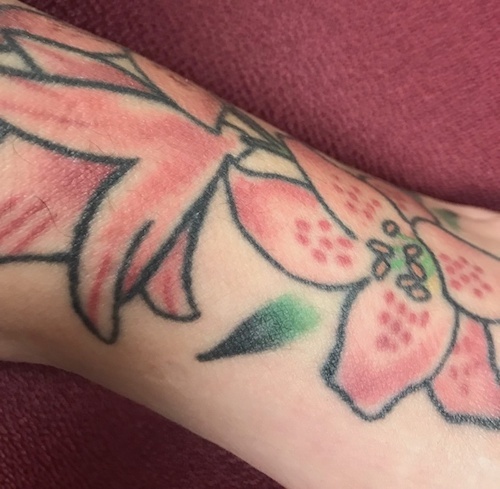 Using LDI-ToF-MS, the researchers found evidence suggesting that tattoo pigments do in fact translocate from skin to lymph nodes. They analyzed the four tattooed skin samples containing either red, orange, green, or black ink, as well as two normal skin samples as the control. Pigment particles were detected in the lymph nodes in two of the four tattooed donor samples. As for the other two donors, the lack of pigment in the nodes could have been due to low concentration levels, metabolic decomposition, or translocation to different lymph nodes not included in the sample tissue. The ICPMS results support the other main research goal: showing that elements from tattoo pigments can enter the lymph nodes. Common elements found in tattoo ink include nickel, chromium, manganese, cobalt, titanium dioxide, and carbon, depending on the pigment. For instance, black ink contains carbon, while white ink (used mostly for shading) can contain titanium dioxide. This technique was also used to determine the nanoscale sizes of different pigment particles. Most tattoos start as an outline in black ink, which contains carbon. Elevated levels of aluminum, chromium, iron, nickel, and copper were found in the skin tissue and/or lymph nodes of the donor samples. Nickel and chromium, found in two of the donors, can be both allergenic and carcinogenic. Aluminum was found in three of the four donors, but this element is also strongly linked to antiperspirants. Interestingly, some of the results suggest that different shades of the same color can affect skin differently. For example, the pigment “phthalocyanine green 36” shows high amounts of copper and small amounts of bromine in both the skin and lymph nodes of a sample. For “phthalocyanine green 7”, on the other hand, these elements were present in the skin, but did not show up in the lymph nodes. Does that mean one shade of green is safer than another? The research does not specify and I’m not sure how a tattoo artist would react if you request green “7” instead of green “36”, but it’s worth a try! Using μ-XRF, researchers could analyze the crystal structure of titanium dioxide detected in the tattoo pigment for some of the skin samples. Depending on its crystal structure, this element can be harmful. Of the two main forms, rutile is less harmful than anatase, which can cause inflamed skin. μ-XRF also helped the researchers determine that the size of particles varies between pigment types. Some particles were as small as ~50 nm and others were as large as a few micrometers, with an average size of 180 nm. The size of the ink particles affects whether or not they can translocate to lymph nodes. For instance, the smallest size of the particles (such as green 36) are likely to transport from the skin to the nodes. Some green inks contain pigment particles that are small enough to easily travel from skin tissue to lymph nodes. Lastly, the researchers used μ-FTIR to analyze changes in the protein and lipids of the skin surrounding the injected tattoo pigment. The FTIR technique confirmed that pigment particles can affect the proteins in skin cells surrounding a tattoo, and in rare cases, lead to inflammation. However, there was no evidence of the pigment affecting the molecular structure of the lymph nodes. Still Have a Taste for Ink? Through the researchers’ work, there is now strong analytical evidence that tattoo pigment particles translocate from skin to lymph nodes and, further, that toxic elements can be present in these pigments. However, it remains unclear whether or not this has adverse health effects and tattoo ink might not have been the only contributing factor in this small sample size. Future research is planned in order to make a better assessment on the safety of tattoos. For now, at least we are aware that there are more potential risks than simply regretting the design you picked. I. Schreiver, B. Hesse, C. Seim, et al., “Synchrotron-based ν-XRF mapping and μ-FTIR microscopy enable to look into the fate and effects of tattoo pigments in human skin,” Springer Nature, vol. 7, no. 11395, 2017.